Now that you’ve gotten everything you need for your move, it is essential that your moving boxes are labeled correctly. However, as opposed to using the usual paper tape and just scribbling labels, a more professional and orderly approach can be achieved through the application of label collections. We have been able to develop a label collection that makes labeling and categorizing more effective, and you can be rest assured that with these labels, identifying and spotting particular moving boxes based on certain criteria will be all the easier. 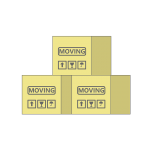 When setting up labels for moving boxes and other items, a lot of complexity is usually involved. You need to ensure that everything is correctly spelled and that basically every item that you have is properly represented. However, our label collection makes it extremely easy for you to label things and give them tags by getting rid of ay excessive complexity involved. Basically, labeling has never been this easy. As opposed to other labeling collections that are limited in labeling scope, our collection enables you to categorize your boxes in relation to a wide array of parameters. Whether it’s “big”, “small” and “medium”, “fragile” and “non-fragile” or any other personal parameters that will help you to move things more effectively, you can count on this label collection to help you out. How many labels are you going to be in need of in order for your move to be seamless? A lot of other labeling collections are usually limited by the number of labels as well. This essentially makes them ineffective for moving projects in which a lot of items are involved if you have such a moving project, then you have absolutely no reason to worry as we’ll be able to effectively help you out. Our labeling collection contains numerous labels, and you can rest assured that no matter how gargantuan your labeling is, we’ll be able to get you covered. Our label collection is highly effective. However, you’ll also find that it is one of the cheap boxes in the market today, you get to pay less and get more value, and you don’t need to break the bank in order to get a premium and highly efficient label collection with us.